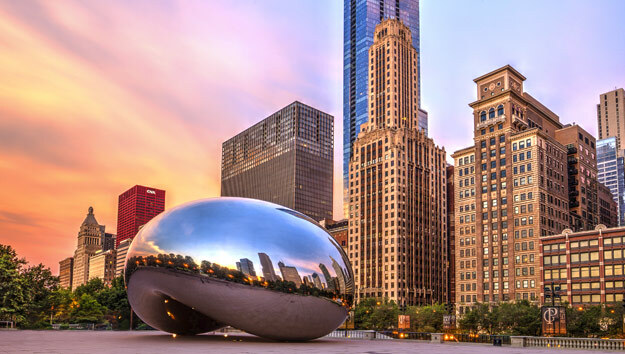 Awesome architecture, skyscrapers with forever vistas, world-class museums, Lake Michigan shoreline, a plethora of parks, impressive outdoor art installations, wonderful shopping, great restaurants – Chicago, the 3rd largest city in the U.S., has it all. Big Bus Tours Chicago: Double decker Big Bus gets you around to see all the important sights plus gives you hop off/hop on options at 14 stops. Hop off at the closest stop to places you want to see, take your time exploring and hop on the next Big Bus that comes by. Throughout the day, repeat as often as you like. Want to stretch it out to see more? Consider Big Bus Chicago 48 Hour. Segway Tours: Here’s a way to see Chicago and have lots of fun doing it: glide through it on a Segway. The 2 or 3 hour seasonal tours (April 1 – Oct 31) are great for anyone over 12 who enjoys seeing the sights and being outdoors. The bonus: enthusiastic, informed guides who have fun showing you their city. Here’s an awesome way to see the city: from two skyscraper observation decks over 1,000 feet above the ground. Both have a thrill factor. From the Willis Tower Sky Deck’s Ledge, hang out 1,352 feet over the city while standing on an enclosed glass-walled ledge! Or, literally, tilt out over the edge at 1,000 ft. up for downward-facing views from high atop the John Hancock Building in 360 Chicago’s Tilt. Both venues also have tamer ways to see panoramic views from large observation windows and interesting exhibits. Navy Pier: A favorite of kids and tourists, the pier jutting out 1.3 miles into Lake Michigan, has a lot going on. Open year-round, it’s super-active in the summer months, quieter in the winter. Walk the pier, watch boats coming and going; have a bite to eat, shop for souvenirs, sip a beer. Step into a rainforest; play miniature golf; find your way out of a funhouse maze. 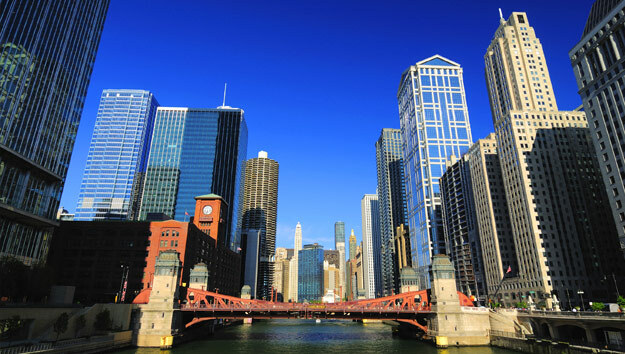 Experience the Children’s Museum; attend a play at Chicago Shakespeare Theater; ride a Ferris wheel, where lake and skyline views from 150 feet in the air are spectacular. Walk the Lakefront Trail: Get on your walking shoes for an urban trek along a scenic 18-mile dedicated paved pathway along Chicago’s shoreline, both North and South. Take in the surroundings and neighborhoods. Grab refreshments at a concession stand; find a pretty spot with great views to hang out and take it all in. Art Institute of Chicago: The diversity and depth of world-class art in America’s 2nd largest art museum is astounding. Ancient Chinese bronzes, beautiful jade, spectacular woodcuts; Medieval armor and tapestries; Mediterranean mosaics; intricate Islamic treasures; Africa and Mesoamerican masks and sculpture. Great works of the European masters; stellar American art from the 18th century to the 1950s, and decorative art from the 17th century. The best works from the innovators of change: Impressionists. Post-impressionists and Expressionists; and bold, dynamic contemporary art. Museum of Science & Industry: It’s an experience with a huge Wow! factor. One of the largest science museums in the world, it’s a captivating and compelling trip through the ingenuity of science, technology, medicine and engineering. While geared towards kids, it’s relevant and attention-grabbing for all ages. Interactive exhibits run the gamut – trains, planes, space travel, storms, human development, are just a few. Do stuff: go down in the coal mine; ride a flight simulator, climb inside the legendary U-505 submarine. The Three Museum “Palaces”: Lined in a row along the lakefront, within walking distance of each other, these three famous Chicago museums take a good amount of time to enjoy. Forty-two foot long Sue, the largest and most complete T-rex fossil ever found, positioned at the entrance of the Field Museum sets the stage for the breadth of the interesting natural history collections inside. 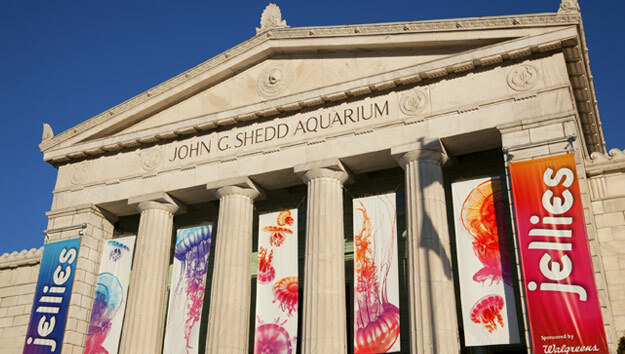 The Shed Aquarium exhibits highlight diversity of the world’s marine life in wonderful habitat zones – the Caribbean, the Great Lakes and in the Amazon, are but a few. Kids love the touch tanks, entertaining otters and waddling penguins. The Adler Planetarium is the place to connect with the wonders of space and the planets through exhibits and spellbinding sky shows. The Chicago River, snaking through the city, is a wonderful place from which to see the architectural details of Chicago’s globally acclaimed skyscrapers. 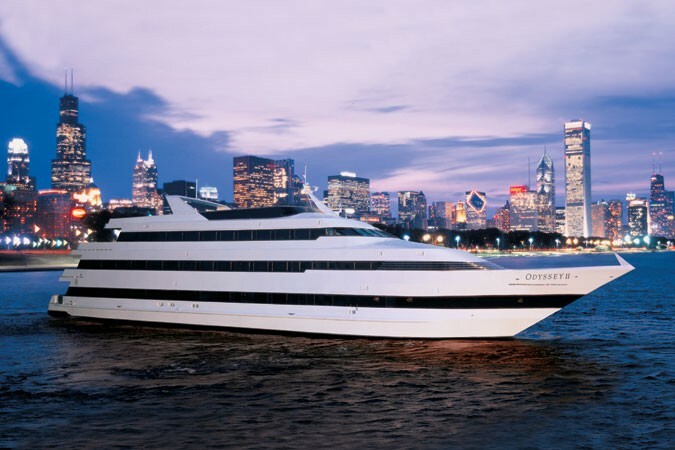 Chicago Architecture Foundation River Cruise: Certified volunteers serve as guides aboard the First Lady Cruise vessel, whose open top and climate-controlled lower deck offer ample viewing choices. See the rows of grand buildings so high they appear to lean in on the meandering river. 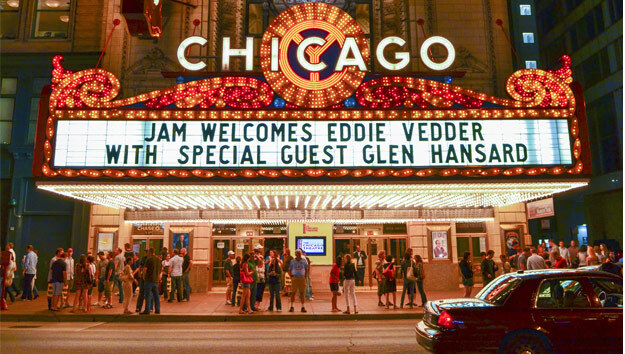 Learn how Chicago’s competitive architectural environment propelled it to greatness on the 90-minute seasonal tour. 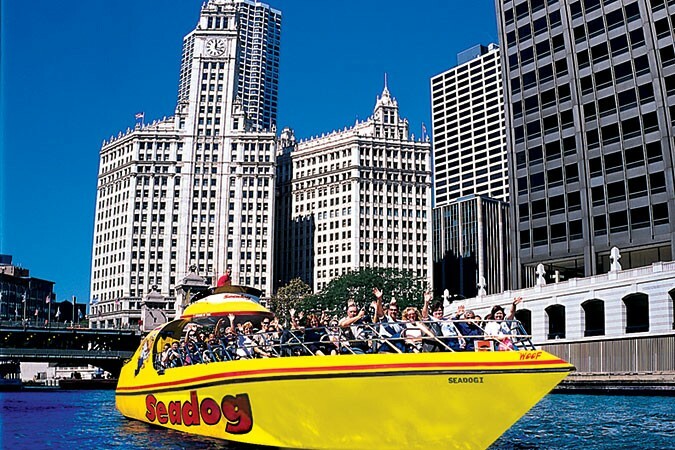 Seadog Speedboat Lake Tour: Combine a fast, exciting 30-minute speedboat ride from Navy Pier, along Lake Michigan’s shoreline watching Chicago’s dramatic skyline flying by. In all the right places, the engine idles so you can hear about the landmarks, cool places, architecture and history, then zoom on to the next. Magnificent Mile is Chicago’s famous shopping avenue is a must do for committed shoppers. It’s the place to walk, browse shops, art galleries, antique stores in storefronts lining Michigan Avenue, or in multi-floored, glass-walled interior shopping complexes. Lots of restaurant choices are here too. Millennium Park is Chicago’s gathering spot and outdoor gallery for the city’s significant public art collection. See your reflection in Cloud Gate, the huge elliptical stainless steel art installation, and the stainless Jay Pritzker Pavilion, a venue for seasonal outdoor concerts. Check out Crown Fountain, where faces of Chicago citizens are reflected in two 50 foot Towers. Walk through the Boeing outdoor galleries of large contemporary art installations.